Tyrol (German: Tirol, Italian: Tirolo, Ladin: Tirol) is a (historical) region in the Alps, consisting of the very northern part of Italy and a neighbouring western part of Austria. It borders to the Italian region of Lombardy, the Swiss canton of Graubünden and the Austrian state of Vorarlberg in the west, the German state of Bavaria in the north, the Austrian states of Salzburg and Carinthia in the east, and the Italian region of Veneto in the south. The region of Tyrol is similar to the former County of Tyrol. This county was part of Austria-Hungary till 1919. After World War I it was divided between Austria (North Tyrol) and Italy (South Tyrol). Nowadays these expressions have different meanings (see below). 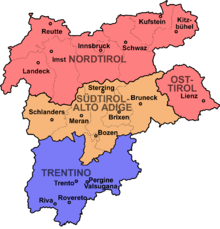 Since 1996 the region of Tyrol has been a Euroregion, called Tyrol-South Tyrol-Trentino Euroregion (German: Europaregion Tirol-Südtirol-Trentino, Italian: Euregio Tirolo-Alto Adige-Trentino). The region of Tyrol is also divided into three languages. In East and North Tyrol German is spoken. 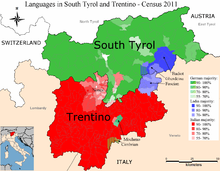 South Tyrol is primarily German with a little Italian and Ladin, Trentino is primarily Italian with a little German and Ladin. The region of Tyrol is a very mountainous area. It belongs to three ranges of the Eastern Alps. A great part of the Southern Limestone Alps (among them the Dolomite Alps) and also a southern part of the Central Eastern Alps cover the Italian part of Tyrol, whereas the middle of the Central Eastern Alps and a great part of the Northern Limestone Alps (among them the southern Allgäu Alps) cover the Austrian part of Tyrol. Several well-known geographical locations lie in Tyrol. For example the Brenner Pass, a mountain pass on the border of Austria and Italy, Lake Garda, the biggest lake of Italy and partially situated in Tyrol, and various places, in the state of Tyrol: Innsbruck (its capital) and Lienz, and in Trentino-Alto Adige/Südtirol: Trento (its capital), Bolzano / Bozen and Merano. This page was last changed on 10 February 2017, at 11:00.